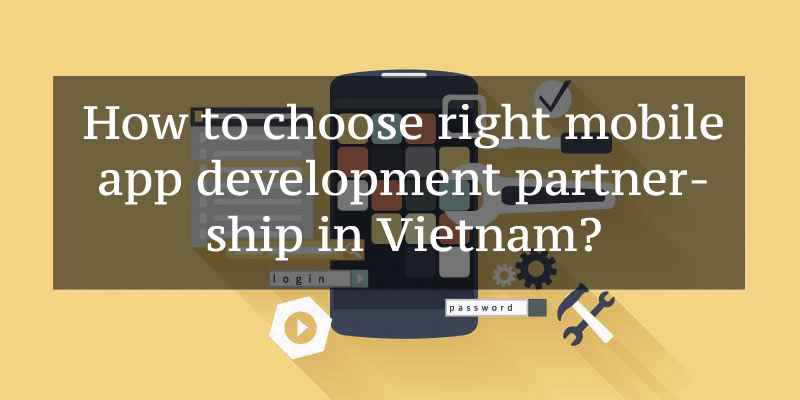 How to choose right mobile app development partnership in Vietnam? Home Mobile App Development How to choose right mobile app development partnership in Vietnam? You just win a competition for startups, and you need to develop your idea into a new mobile app? You don’t have a team to make your dream come true? You worry to find a trusted software development partner? Here are some guidelines which will help you find your wished IT agency to actualize your mobile application idea. 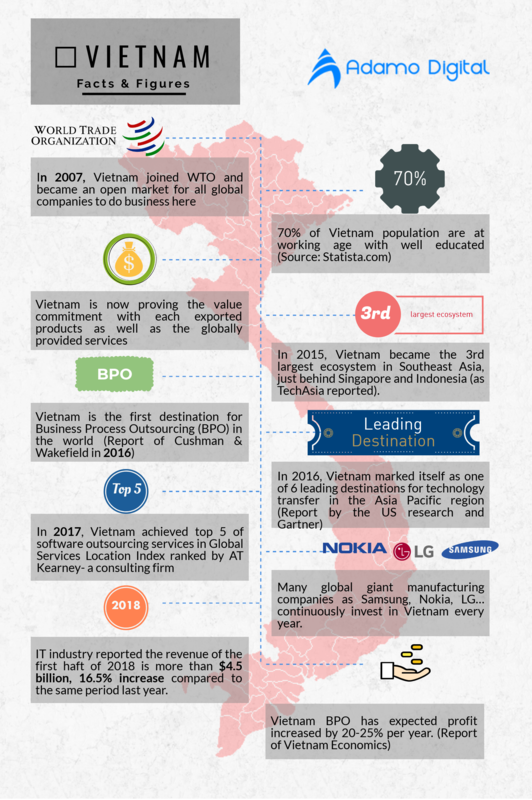 As the previous blog post about selecting website development partner in Vietnam, I mentioned a list of facts and figures which may be summarized in the infographic below, that is why Vietnam is in the top of the potential country in IT outsourcing market. There are about 4000 IT agencies in Vietnam, so how can you select your ideal one for your project? #1 Firstly, what are your requirements? Obviously, having ideas about an app will include a lot of information, you may imagine the features and advantages of your app, but you may not think about other technical characters such as which platform the app will be- iOS or Android or Window? Do you have the design (UI) of the app? Which functions the app should have to well support each other? Do you need an end-to-end mobile app developer or design app partner or development app only? All these information will be your valuable materials which help you shorten your list and match with your selected partner. Similar to finding the web development partner, using the power of your connection helps you put some trusted partners into your list as well as understand the IT agencies’ competitive advantages and reference. Besides, you can ask for some reviews on some reputation source such as Clutch – a B2B rating and review platform, GoodFirms-a research and reviews of IT Companies and Software, Sortlist -a agencies research and review, and more. From that, you can see all the reviews and rating your IT agencies list. This should be better if your selected partner did some similar projects as your requirements before, then they can suggest some idea to smooth your collaboration. Therefore, checking the partners’ portfolio may provide you with the idea of their real capabilities. Asking for some case study or the app they did develop to experience their skills and if the sample apps match your style. Checking partner’s portfolio is not enough. The mobile application development team will be the ones who realize your idea into a really interesting app. They should have their own testing team (QA) to ensure the quality of your mobile app. Double-check that you can understand each other and smoothly communicate, discuss with the team may contribute fifty percent of your success. Furthermore, with their experience in the previous apps, they can share their point of views to boost up the revenue you can earn from the app. As mentioned in number two, checking reference will determine the pros and cons of your partners as well as their capabilities. Asking these reference companies about their experience when working with your partner, if they happy with the result your partner provided if the project was finished on time and budget. The issue of price nowadays is not the strong-willed factor driving your decision, however, getting the quality application is the most important. Remember, the cheapest isn’t always the best, but neither is the most expensive. The most trusted and reliable mobile application development partner will show you not only the price for their service, but also details the strategy to work with you, and how can you evaluate their results. Getting across some agencies, and coming to your final decision with the one makes you feel comfortable working with. I think these tips will be useful for your purpose and support your business. With Adamo Digital, we’re proud to share with you about our achievement in the top of Mobile application development agencies rated by GoodFirms, this is the best present for our hard-working in this 2018 from our partners and GoodFirms as well. Want to know more about our mobile application development process and case studies, don’t forget to contact us. How will AI change the Travel agency nowadays?